Last night I looked over my composition and looked through some watercolor books, including a history of British watercolor. I wanted to sort out what to do about the sky. Before doing some research I was thinking of a dramatic stormy sky with sun shining through from the side, but when I looked at other cases next to mine, that no longer seemed appropriate. I opted for a light sky of Prussian Blue and Ultramarine with hints of clouds so as not to distract from the ferry and the town. I will have to redraw the ferry, and I am wondering about a few other areas of this, so for tonight I am leaving it as is. I did do a few experiments on the side that aren’t worth posting, but they got me going on a few new ideas. More to come on that front as well. 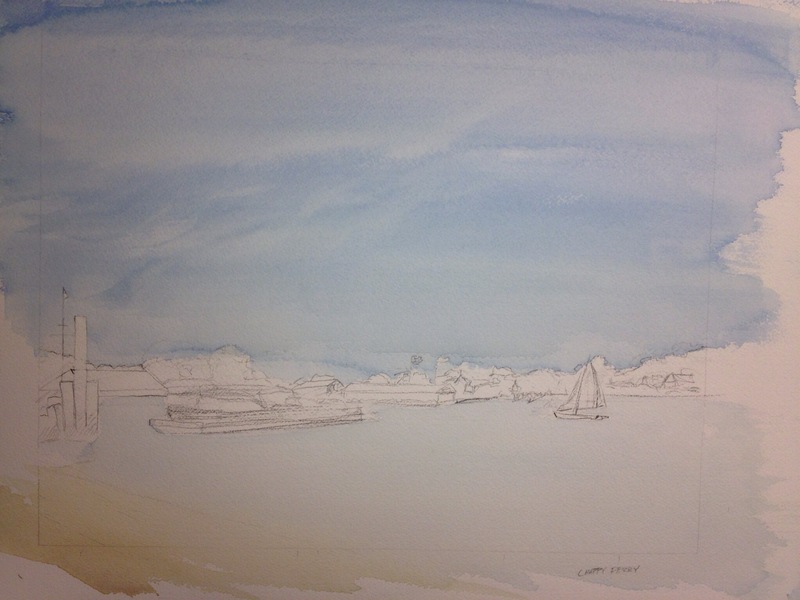 For now, here’s a look at the Chappy Ferry painting with the sky in and the base wash for the water.